Baylor University is a private Christian university. It was established in 1845. Baylor is the oldest continuously running university in the state of Texas. The Baylor Business School was established in 1923. The school offered its first bachelor degree in Business Administration in 1924. Admitted with provisional associate membership in the AACSB in 1950, the school was awarded complete associate membership in 1953. Full AACSB accreditation was achieved in 1959. The Hankamer Building was built in 1960, with the help of Earl Hankamer, a board member, who offered $500,000 toward the construction of the new building. The school was renamed the Hankamer School of Business in 1960 to honor the contribution from Mr. Hankamer’s. The Hankamer School of Business is located on the 1,000-acre Baylor University campus located on the Brazos River, in Waco, Texas. Waco is located about an hour and a half from Dallas. Hankamer also has locations in Austin and Dallas for its Executive MBA programs. In 2015 Baylor University opened the Paul L. Foster Campus for Business and Innovation on the Baylor campus, where the school of business now operates from. Opened in 2015, The new Paul L. Foster Campus for Business and Innovation houses a brand new 275,000-square-foot building for the Hankamer School of Business. 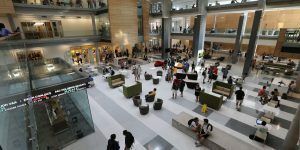 It expands the size of the Business School by almost 40 percent. It features classroom-learning spaces that are fully equipped with the latest classroom technology, a 350-seat auditorium and an adjacent Conference Center. The Hankamer School is also home to several centers and institutions that provide students with access to research, technology, business support and other educational resources. Centers and institutions at the school include: The Technology Center, Center for Business & Economic Research, Center for Professional Selling, John F. Baugh Center for Entrepreneurship, McBride Center for International Business, The Keller Center for Real Estate Sales & Marketing, Hodges Financial Markets Center and the Baylor Institute for Family Business. Hankamer students have access to the Office of Career Management at Baylor University. Career Management staff work with students on personal branding, resume creation and review and interview preparation. There are approximately 200 faculty members at the Hankamer School of Business. With around 3,000 students enrolled in the business school the student to faculty ratio at Hankamer is about 19:1. Over 600 students are enrolled in the Hankamer School of Business graduate programs, with an average GMAT score of 607. The Hankamer School of Business offers full-time MBA and Online MBA programs. The school also offers two Executive MBA programs at its other campuses in Dallas and Austin.